The Secret to Rebranding Success: Stay Confident! 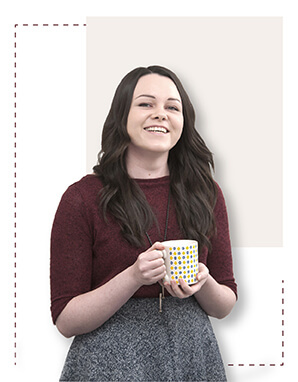 You could say I’ve just went through my own personal rebrand, and I know first hand that the way to work it is to stay confident! Adjustments, compliments and the dreaded backlash all come hand in hand with going through a change in appearance. Thankfully I haven’t had any backlash myself! But for big companies, it’s a given. Everyone has an opinion and when your brand is known worldwide.. that’s a lot of opinions. One company that is met with a lot of undesirable opinions on their rebranding efforts is Pepsi. Go on to any blog or forum that includes their most recent branding and you will scroll through a lot of objectionable reactions. 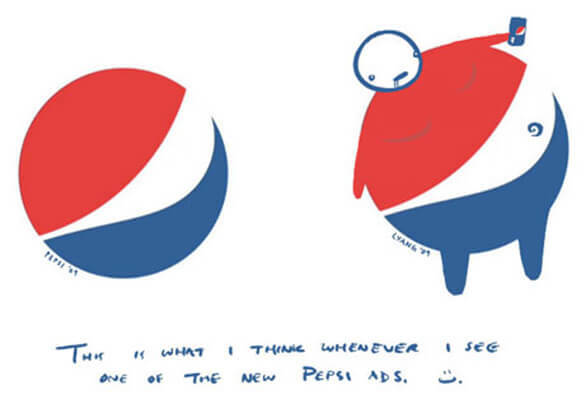 You’ll never be able to see anything but that fat guy now whilst browsing the soft drinks aisle. Personally, I prefer this new logo to their previous offering. It’s a lot cleaner, fresher and friendly. Not so PEPSI in your face as the last one. I think the designers took it on the right path, in keeping the recognisable red and blue circular mark, but making slight changes to the white central panel and removing those questionable highlights. The ‘flowing’ language is emphasised here and also introduced nicely into the new slimline font. This current logo has been around since 2008, 6 years later and still going strong – the onslaught of negativity hasn’t bashed their confidence… and good on ‘em! When it comes to a rebrand, you’re never going to please everybody. There will always be differing opinions. It’s important to take notice of every reaction – I’m not telling anybody to be deluded and ignore all negativity while reaping in the positives – but if you are confident enough in how you are portraying yourself and your company isn’t sliding down the slippery slope of ruin, then rock that new look! Radical makeover or just a nip & tuck? One of the biggest considerations in a rebrand is how drastic to go with it. Rebranding doesn’t always mean you need to create a new name, logo, message.. fire some staff.. buy a new stapler.. or whatever else you can think of to change that working environment of yours. Sometimes just a little tweak here and there can be enough. Many brands have revitalised themselves with only simple changes. Take Apple for example, one of the best known brands in the world. 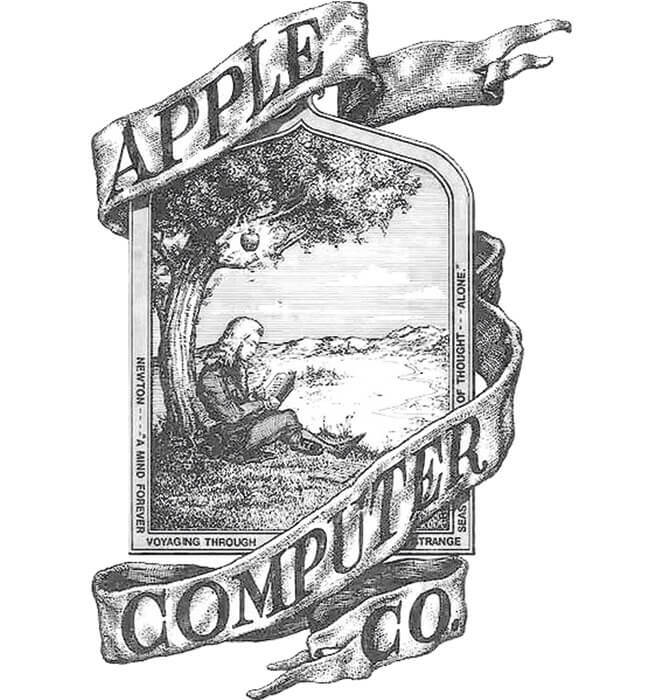 They began their life in 1976 known as Apple Computer Co. but as they evolved into new lines of business beyond computers, that name became restrictive. The solution? A quick snip to the nonessential words and the simplicity of Apple was ready for growth. 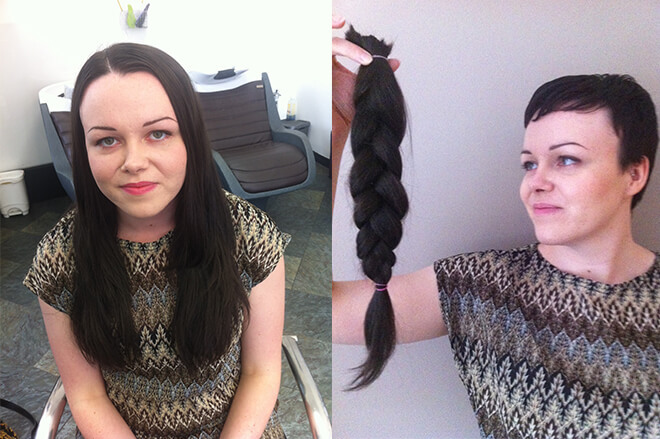 Not a drastic change – but a significant one. Please don’t fall off your chair when I show you this. This original, too complex logo was scrapped less than a year later. Can you imagine how differently we might view their brand today with this logo? But anyway, that’s a whole new blog post in itself. They then moved on to the lovely apple with the bite missing – with some brash colours to boot, and thankfully in 1998 on to the monochrome versions that we know and love today. A big makeover is always a risk for any company, but even more so when that company is well-known and well-loved. The timing of Apple’s makeover was perfect – right at the beginning before they were fully established. Just think of the outrage they would cause with a rebrand of a similar level nowadays! A few die hard fans might smash instead of bite that apple. A full makeover to kick things off, some polishing of the features, a quick snip of the unwanted and a little wardrobe change to finish. So, what’ll it be for you? Radical makeover or nip & tuck? … we can send you a catalogue. In my last blog post, I spoke about how a rebrand can go wrong. So in this one, I’ll be a bit nicer and focus your attention on when things go right. I don’t want to scare you off the idea of a rebrand, after all.. I’d be out of a job. To put it simply, a rebrand isn’t just creating a new logo that looks nice and putting it all over your company.. it’s about discovering what message you want to deliver – cleverly incorporating that into a logo and continuing to deliver it throughout every element of your pursuit. 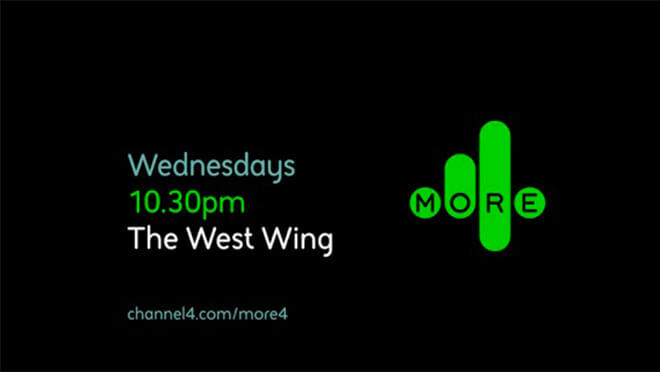 The most recent rebranding of More4 created one of my all time favourite brands. I’m well known in the studio for my love of all things geometric, so it’s obvious why I have a soft spot for this wee dreamboat. Besides the look of it though, this rebrand perfectly demonstrates how to get a message out there. More4 was becoming more of a ‘lifestyle’ channel, with content showing us how to be creative – restoration.. fashion.. cookery.. and the previous logo wasn’t standing well alongside this. It’s still a good-looking logo, it was a bold and uncompromising brand that worked with More4’s original, more ‘grown up’ content and ambitions, but the shift in the content of the channel cried out for a new look. Alongside this new style of content, More4 had an upcoming launch of a ‘scrapbook’ service, where viewers could go online to ‘cut out and keep’ their favourite ideas from the shows. The rebrand also pulled from this upcoming service to adopt its ‘flipping’ movement style – resembling flipping through the pages of a book. This understanding on movement plays a huge part in the beauty of this logo – even in the flat logo, the clever placement of shadows and highlights almost entices the viewer to flip over each 3D segment. This urge to get hands-on with it clearly hit the studio creators too, as they teamed up with Jason Bruges Studio to physically build and implement their little flippers in real locations.. These beautiful idents lovingly portray the ‘making things’ ideology behind More4’s new creative path. I take my hat off to everyone behind them for actually getting out there and doing it instead of computer generating all the magic – it really implements what the brand is all about. 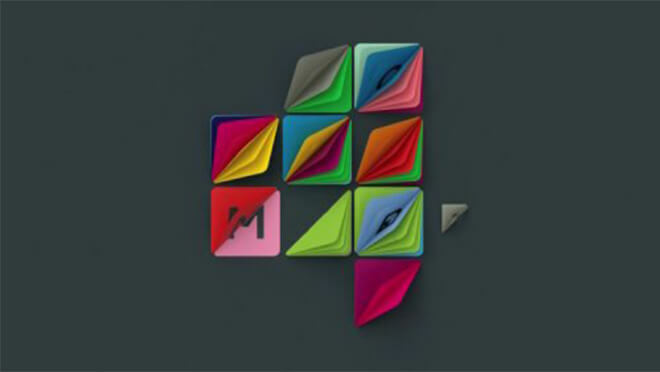 The freedom the logo has to move, to be alive, to create a new look every time, ties in absolutely with More4’s new focus on creative content and the exciting array of colours also awakens creativity and imagination. All in all – it’s an example of a foolproof rebrand that tells the story it’s supposed to tell. Next in line is the ITV rebrand.. This project followed some major re-organisation at the network, there were big changes staff wise and therefore approach wise. Their ambition was to turn ITV Creative into a respected, award-winning agency, starting with their own on-air content. 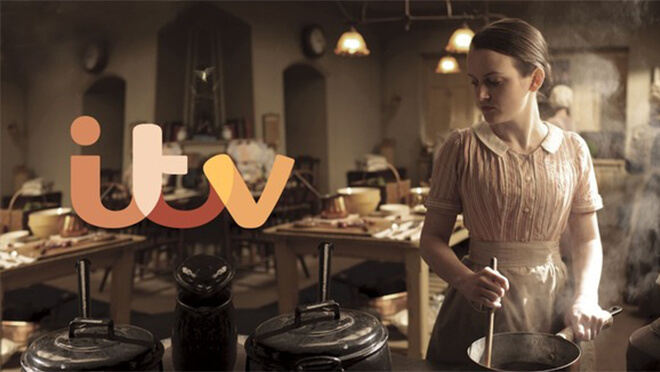 ITV provides hugely popular content that brings all sorts of people together, this stream of popular culture influenced the need for a more friendly logo. The soft, cursive font is more inviting and lively – the previous logo looked stagnant and boring.. definitely not that of a directional tv channel. The more ‘fun’ approach to the logo however, was met with some debate over how it will deal appropriately with more serious content, such as the news.. ..I think it deals with it just fine. Using only one spot colour gives it a more sombre appearance, but still keeps that soft, inviting appearance. Not all news is bad news! 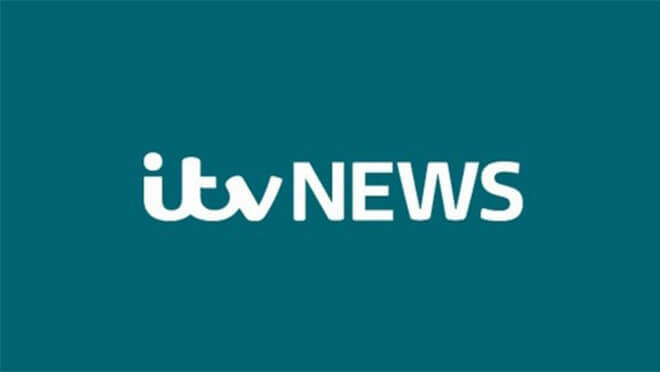 A big factor of the rebrand included the task of cementing the relationship in viewers minds between the shows and the ITV brand that produces and broadcasts them. The solution to this is my favourite part of the brand.. The on-screen logo will adapt to the tone and colour scheme of the footage being promoted using a ‘colour-picking’ feature. This creates a brand which proudly shows the network’s content – fusing with the imagery to fit comfortably alongside the particular show rather than overpowering it. The colours used in the main logo are picked from all over the spectrum, to hint at the ever evolving and adaptable colour scheme. It works even better when seen in motion.. Both examples I’ve spoken about here have nailed the rebranding process. How have they done it? Simple; they haven’t just slapped a new logo all over the place, they’ve put that all important message all over the place. The risky business of a rebrand. The final 8 words in that definition are the absolute key to a successful rebrand and should be cemented in the minds of all involved in the identity overhaul. Of course a company has to be happy with the way they look but an element of self-forgetting needs to happen during the process to think about your customers; existing customers who already love you for what you are.. will they turn their back on you when you change what they’re familiar with? potential customers who have never noticed you amongst the competition.. could you grab their attention with this new look? With a rebrand done correctly, you don’t have to make a choice – you get to keep your already existing customers while attracting new ones. With a rebrand gone wrong, however – you get neither. It’s a sad moment when a company releases their exciting new look and you feel more baffled than impressed. Like most things in life, it’s all down to taste and opinion – you can’t please all of the people all of the time, as they say – but there are times when it goes monumentally wrong and you don’t please any of the people any of the time. A perfect example of ‘if it ain’t broken, don’t fix it’. I do commend their bravery in attempting a drastic change of such a well known, loved brand but I do not commend their outcome. I’m not alone on that either – the rebrand was received with very tightly crossed arms. That tall, serifed and handsome font replaced by the ever conventional Helvetica.. that beloved blue square shrunk and dropped clumsily on the end.. and don’t even get me started on that gradient. 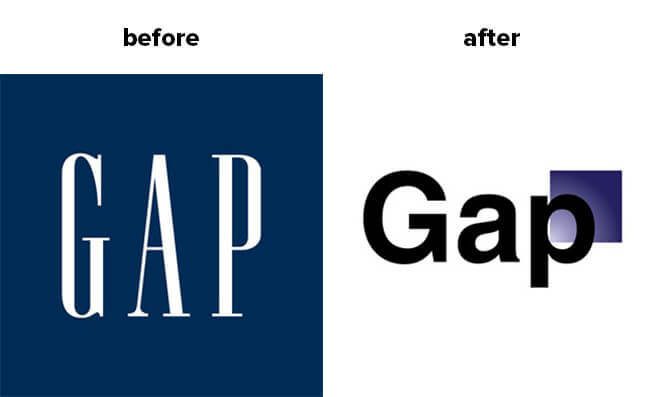 The widespread less than impressed reaction resulted in GAP performing the fastest branding turnaround of all time – reverting back to the original in just 6 days. There comes a risk with any rebrand – depending on the scale of the company whether that risk is a big one or a colossal one – to increase your chances of coming out the other end of that colossal task with a smile on your face and a fat wallet, always remember to keep your customers at the forefront of any decision. Think why they fell in love with your company in the first place – they love your goals, message and culture – your identity puts a face on those things. They get familiar with that face, they trust that face. Then you go and change that face.. that makes them worry what else has changed.. are you still the same on the inside? That question is the crucial element in a rebrand. It’s not about just changing a logo, it’s about taking what’s on the inside, taking a company’s ethos and carrying them forward – interpreting them in a beautifully designed identity.